The commercial-grade ZG300 Series is designed for everyone from city and commercial landscape crews to property owners with acres of ground to cover. For industry-leading power, efficiency and durability choose Kubota. 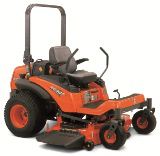 BUILT FOR POWER, DURABILITY AND PERFORMANCE: ZG300 mowers are available with durable 27 gross HP Kubota air cooled gasoline engines, and feature deep mower decks for exceptional cutting performance. COMFORTABLE AND EASY OPERATION: 1. Full-flat operator platform. 2. Adjustable, high-back deluxe suspension seat with armrests, lumbar support, weight adjustment and more for a custom fit. 3. 1/4 in. increment cutting height adjustment with the simple twist of a dial. 4. Adjustable speed control levers. 5. Hands-free parking brake. 6. Large, 12.9 gal. fuel tank for more efficient working. EASY MAINTENANCE: Maintenance has never been so easy. For interior maintenance, the sturdy seat panel is simply lifted up for clear access and an unobstructed view. By opening the hood, it's easy to perform routine maintenance – like adding oil – in mere seconds. Plus, there's a maintenance hatch on the full-flat platform, with a built-in storage pocket for easy access to the upper mower, gearbox case and universal joint parts.